In HW1, we explored how to make predictions (with uncertainties) about upcoming elections based on the Real Clear Politics poll. This assignment also focuses on election prediction, but we are going to implement and evaluate a number of more sophisticated forecasting techniques. The data for our analysis will come from demographic and polling data. We will simulate building our model on October 2, 2012 -- approximately one month before the election. The questions in this assignment are numbered. The questions are also usually italicised, to help you find them in the flow of this notebook. At some points you will be asked to write functions to carry out certain tasks. Its worth reading a little ahead to see how the function whose body you will fill in will be used. This is a long homework. Please do not wait until the last minute to start it! Here is some code to plot State Chloropleth maps in matplotlib. make_map is the function you will use. US Presidential elections revolve around the Electoral College . In this system, each state receives a number of Electoral College votes depending on it's population -- there are 538 votes in total. In most states, all of the electoral college votes are awarded to the presidential candidate who recieves the most votes in that state. A candidate needs 269 votes to be elected President. We will start by examining a successful forecast that PredictWise made on October 2, 2012. This will give us a point of comparison for our own forecast models. 1.1 Each row is the probability predicted by Predictwise that Romney or Obama would win a state. The votes column lists the number of electoral college votes in that state. Use make_map to plot a map of the probability that Obama wins each state, according to this prediction. Later on in this homework we will explore some approaches to estimating probabilities like these and quatifying our uncertainty about them. But for the time being, we will focus on how to make a prediction assuming these probabilities are known. Even when we assume the win probabilities in each state are known, there is still uncertainty left in the election. We will use simulations from a simple probabilistic model to characterize this uncertainty. From these simulations, we will be able to make a prediction about the expected outcome of the election, and make a statement about how sure we are about it. 1.2 We will assume that the outcome in each state is the result of an independent coin flip whose probability of coming up Obama is given by a Dataframe of state-wise win probabilities. Write a function that uses this predictive model to simulate the outcome of the election given a Dataframe of probabilities. Each element stores the number of electoral college votes Obama wins in each simulation. The point of creating a probabilistic predictive model is to simultaneously make a forecast and give an estimate of how certain we are about it. However, in order to trust our prediction or our reported level of uncertainty, the model needs to be correct. We say a model is correct if it honestly accounts for all of the mechanisms of variation in the system we're forecasting. In this section, we evaluate our prediction to get a sense of how useful it is, and we validate the predictive model by comparing it to real data. 1.4 Suppose that we believe the model is correct. 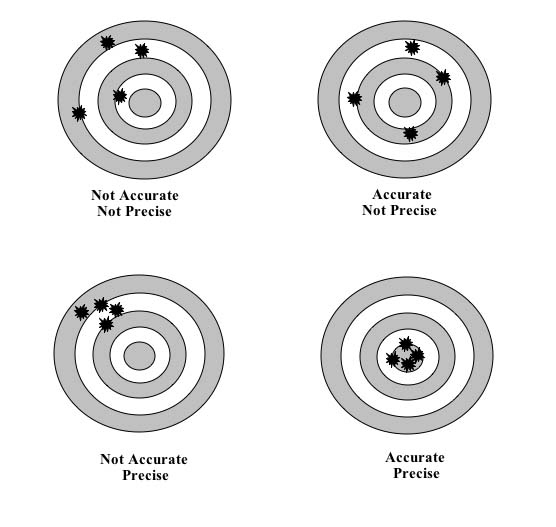 Under this assumption, we can evaluate our prediction by characterizing its accuracy and precision (see here for an illustration of these ideas). What does the above plot reveal about the accuracy and precision of the PredictWise model? 1.5 Unfortunately, we can never be absolutely sure that a model is correct, just as we can never be absolutely sure that the sun will rise tomorrow. But we can test a model by making predictions assuming that it is true and comparing it to real events -- this constitutes a hypothesis test. After testing a large number of predictions, if we find no evidence that says the model is wrong, we can have some degree of confidence that the model is right (the same reason we're still quite confident about the sun being here tomorrow). We call this process model checking, and use it to validate our model. Describe how the graph provides one way of checking whether the prediction model is correct. How many predictions have we checked in this case? How could we increase our confidence in the model's correctness? Now we will try to estimate our own win probabilities to plug into our predictive model. We will start with a simple forecast model. We will try to predict the outcome of the election based the estimated proportion of people in each state who identify with one one political party or the other. Each row lists a state, the percent of surveyed individuals who identify as Democrat/Republican, the percent whose identification is unknown or who haven't made an affiliation yet, the margin between Democrats and Republicans (Dem_Adv: the percentage identifying as Democrats minus the percentage identifying as Republicans), and the number N of people surveyed. 1.6 This survey can be used to predict the outcome of each State's election. The simplest forecast model assigns 100% probability that the state will vote for the majority party. Implement this simple forecast. Now, we run the simulation with this model, and plot it. 1.7 Attempt to validate the predictive model using the above simulation histogram. Does the evidence contradict the predictive model? The model above is brittle -- it includes no accounting for uncertainty, and thus makes predictions with 100% confidence. This is clearly wrong -- there are numerous sources of uncertainty in estimating election outcomes from a poll of affiliations. The most obvious source of error in the Gallup data is the finite sample size -- Gallup did not poll everybody in America, and thus the party affilitions are subject to sampling errors. How much uncertainty does this introduce? 1.8 Use Gallup's estimate of 3% to build a Gallup model with some uncertainty. Assume that the Dem_Adv column represents the mean of a Gaussian, whose standard deviation is 3%. Build the model in the function uncertain_gallup_model. Return a forecast where the probability of an Obama victory is given by the probability that a sample from the Dem_Adv Gaussian is positive. * Obama: probability that the state votes for Obama. 1.9 Attempt to validate the above model using the histogram. Does the predictive distribution appear to be consistent with the real data? Comment on the accuracy and precision of the prediction. Gallup is wrong. The poll may systematically over- or under-estimate party affiliation. This could happen if the people who answer Gallup phone interviews might not be a representative sample of people who actually vote, Gallup's methodology is flawed, or if people lie during a Gallup poll. Our assumption about party affiliation is wrong. Party affiliation may systematically over- or under-estimate vote proportions. This could happen if people identify with one party, but strongly prefer the candidate from the other party, or if undecided voters do not end up splitting evenly between Democrats and Republicans on election day. Our assumption about equilibrium is wrong. This poll was released in August, with more than two months left for the elections. If there is a trend in the way people change their affiliations during this time period (for example, because one candidate is much worse at televised debates), an estimate in August could systematically miss the true value in November. One way to account for bias is to calibrate our model by estimating the bias and adjusting for it. Before we do this, let's explore how sensitive our prediction is to bias. 1.10 Implement a biased_gallup forecast, which assumes the vote share for the Democrat on election day will be equal to Dem_Adv shifted by a fixed negative amount. We will call this shift the "bias", so a bias of 1% means that the expected vote share on election day is Dem_Adv-1. Hint You can do this by wrapping the uncertain_gallup_model in a function that modifies its inputs. Subtracts a fixed amount from Dem_Adv, beofore computing the uncertain_gallup_model. in the original Gallup data. 1.11 Simulate elections assuming a bias of 1% and 5%, and plot histograms for each one. Note that even a small bias can have a dramatic effect on the predictions. Pundits made a big fuss about bias during the last election, and for good reason -- it's an important effect, and the models are clearly sensitive to it. Forecastors like Nate Silver would have had an easier time convincing a wide audience about their methodology if bias wasn't an issue. Furthermore, because of the nature of the electoral college, biases get blown up large. For example, suppose you mis-predict the party Florida elects. We've possibly done this as a nation in the past :-). Thats 29 votes right there. So, the penalty for even one misprediction is high. While bias can lead to serious inaccuracy in our predictions, it is fairly easy to correct if we are able to estimate the size of the bias and adjust for it. This is one form of calibration. One approach to calibrating a model is to use historical data to estimate the bias of a prediction model. We can use our same prediction model on historical data and compare our historical predictions to what actually occurred and see if, on average, the predictions missed the truth by a certain amount. Under some assumptions (discussed in a question below), we can use the estimate of the bias to adjust our current forecast. 1.12 Make a scatter plot using the prediction_08 dataframe of the democratic advantage in the 2008 Gallup poll (X axis) compared to the democratic win percentage -- the difference between Obama and McCain's vote percentage -- in the election (Y Axis). Overplot a linear fit to these data. Notice that a lot of states in which Gallup reported a Democratic affiliation, the results were strongly in the opposite direction. Why might that be? You can read more about the reasons for this here. A quick look at the graph will show you a number of states where Gallup showed a Democratic advantage, but where the elections were lost by the democrats. Use Pandas to list these states. 1.13 Calibrate your forecast of the 2012 election using the estimated bias from 2008. Validate the resulting model against the real 2012 outcome. Did the calibration help or hurt your prediction? 1.14 Finally, given that we know the actual outcome of the 2012 race, and what you saw from the 2008 race would you trust the results of the an election forecast based on the 2012 Gallup party affiliation poll? In the previous forecast, we used the strategy of taking some side-information about an election (the partisan affiliation poll) and relating that to the predicted outcome of the election. We tied these two quantities together using a very simplistic assumption, namely that the vote outcome is deterministically related to estimated partisan affiliation. In this section, we use a more sophisticated approach to link side information -- usually called features or predictors -- to our prediction. This approach has several advantages, including the fact that we may use multiple features to perform our predictions. Such data may include demographic data, exit poll data, and data from previous elections. First, we'll construct a new feature called PVI, and use it and the Gallup poll to build predictions. Then, we'll use logistic regression to estimate win probabilities, and use these probabilities to build a prediction. To calculate it, let us first load the national percent results for republicans and democrats in the last 3 elections and convert it to the usual democratic - republican format. Let us also load in data about the 2004 elections from p04.csv which gets the results in the above form for the 2004 election for each state. We construct a similar frame for 2012, obtaining pvi using the 2008 Obama win data which we already have. There is no obama_win column since, well, our job is to predict it! We load in the actual 2012 results so that we can compare our results to the predictions. 2.2 Lets do a little exploratory data analysis. Plot a scatter plot of the two PVi's against each other. What are your findings? Is the partisan vote index relatively stable from election to election? 2.3 Lets do a bit more exploratory data analysis. Using a scatter plot, plot Dem_Adv against pvi in both 2008 and 2012. Use colors red and blue depending upon obama_win for the 2008 data points. Plot the 2012 data using gray color. Is there the possibility of making a linear separation (line of separation) between the red and the blue points on the graph? Logistic regression is a probabilistic model that links observed binary data to a set of features. When we fit a logistic regression model, we determine values for each $\beta$ that allows the model to best fit the training data we have observed (the 2008 election). Once we do this, we can use these coefficients to make predictions about data we have not yet observed (the 2012 election). Sometimes this estimation procedure will overfit the training data yielding predictions that are difficult to generalize to unobserved data. Usually, this occurs when the magnitudes of the components of $\beta$ become too large. To prevent this, we can use a technique called regularization to make the procedure prefer parameter vectors that have smaller magnitude. We can adjust the strength of this regularization to reduce the error in our predictions. We now write some code as technology for doing logistic regression. By the time you start doing this homework, you will have learnt the basics of logistic regression, but not all the mechanisms of cross-validation of data sets. Thus we provide here the code for you to do the logistic regression, and the accompanying cross-validation. We first build the features from the 2008 data frame, returning y, the vector of labels, and X the feature-sample matrix where the columns are the features in order from the list featurelist, and each row is a data "point". We use the above function to get the label vector and feature-sample matrix for feeding to scikit-learn. We then use the usual scikit-learn incantation fit to fit a logistic regression model with regularization parameter C. The parameter C is a hyperparameter of the model, and is used to penalize too high values of the parameter co-efficients in the loss function that is minimized to perform the logistic regression. 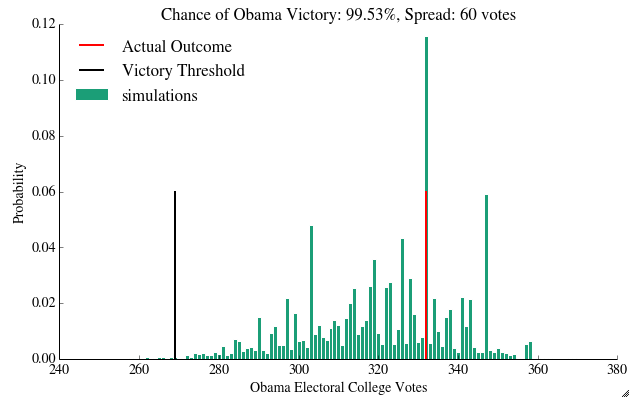 We build a new dataframe with the usual Obama column, that holds the probabilities used to make the prediction. Finally we return a tuple of the dataframe and the classifier instance, in that order. We are not done yet. In order to estimate C, we perform a grid search over many C to find the best C that minimizes the loss function. For each point on that grid, we carry out a n_folds-fold cross-validation. What does this mean? Suppose n_folds=10. Then we will repeat the fit 10 times, each time randomly choosing 50/10 ~ 5 states out as a test set, and using the remaining 45/46 as the training set. We use the average score on the test set to score each particular choice of C, and choose the one with the best performance. Finally we write the function that we use to make our fits. It takes both the 2008 and 2012 frame as arguments, as well as the featurelist, and the number of cross-validation folds to do. It uses the above defined logistic_score to find the best-fit C, and then uses this value to return the tuple of result dataframe and classifier described above. This is the function you will be using. 2.4 *Carry out a logistic fit using the cv_and_fit function developed above. As your featurelist use the features we have: Dem_Adv and pvi. 2.5 As before, plot a histogram and map of the simulation results, and interpret the results in terms of accuracy and precision. One nice way to visualize a 2-dimensional logistic regression is to plot the probability as a function of each dimension. This shows the decision boundary -- the set of parameter values where the logistic fit yields P=0.5, and shifts between a preference for Obama or McCain/Romney. The function below draws such a figure (it is adapted from the scikit-learn website), and overplots the data. 2.6 Plot your results on the classification space boundary plot. How sharp is the classification boundary, and how does this translate into accuracy and precision of the results? In the previous section, we tried to use heterogeneous side-information to build predictions of the election outcome. In this section, we switch gears to bringing together homogeneous information about the election, by aggregating different polling result together. This approach -- used by the professional poll analysists -- involves combining many polls about the election itself. One advantage of this approach is that it addresses the problem of bias in individual polls, a problem we found difficult to deal with in problem 1. If we assume that the polls are all attempting to estimate the same quantity, any individual biases should cancel out when averaging many polls (pollsters also try to correct for known biases). This is often a better assumption than assuming constant bias between election cycles, as we did above. 3.1 Using this data, compute a new data frame that averages the obama_spread for each state. Also compute the standard deviation of the obama_spread in each state, and the number of polls for each state. Lets call the function on the multipoll data frame, and join it with the electoral_votes frame. 3.2 Build an aggregated_poll_model function that takes the avg DataFrame as input, and returns a forecast DataFrame in the format you've been using to simulate elections. Assume that the probability that Obama wins a state is given by the probability that a draw from a Gaussian with $\mu=$poll_mean and $\sigma=$poll_std is positive. Not all polls are equally valuable. A poll with a larger margin of error should not influence a forecast as heavily. Likewise, a poll further in the past is a less valuable indicator of current (or future) public opinion. For this reason, polls are often weighted when building forecasts. We need to find an estimator of the variance of $\mu_i$, $Var(\mu_i)$. In the case of states that have a lot of polls, we expect the bias in $\mu$ to be negligible, and then the above formula for the variance of $\mu$ holds. However, lets take a look at the case of Kansas. There are only two polls in the last year! And, the results in the two polls are far, very far from the mean. Now, Kansas is a safely Republican state, so this dosent really matter, but if it were a swing state, we'd be in a pickle. We'd have no unbiased estimator of the variance in Kansas. So, to be conservative, and play it safe, we follow the same tack we did with the unweighted averaging of polls, and simply assume that the variance in a state is the square of the standard deviation of obama_spread. The equation for $\sigma$ assumes that every measurement is independent. This is not true in the case that a given pollster in a state makes multiple polls, perhaps with some of the same respondents (a longitudinal survey). But its a good assumption to start with. 3.5 Put this all together -- compute a new estimate of poll_mean and poll_std for each state, apply the default_missing function to handle missing rows, build a forecast with aggregated_poll_model, run 10,000 simulations, and plot the results, both as a histogram and as a map. For fun, but not to hand in, play around with turning off the time decay weight and the sample error weight individually. The simulation techniques are partially drawn from Sam Wang's work at http://election.princeton.edu . Be sure to check out the FAQ, Methods section, and matlab code on his site. To submit your homework, create a folder named lastname_firstinitial_hw2 and place this notebook file in the folder. Also put the data folder in this folder. Make sure everything still works! Select Kernel->Restart Kernel to restart Python, Cell->Run All to run all cells. You shouldn't hit any errors. Compress the folder (please use .zip compression) and submit to the CS109 dropbox in the appropriate folder. If we cannot access your work because these directions are not followed correctly, we will not grade your work.